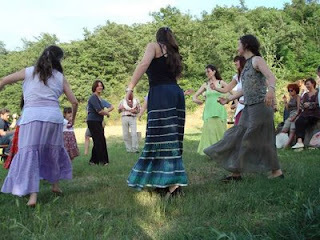 Colleen's Window on Italy: Dancing the Ancient Tarantella at Festa Primavera! Dancing the Ancient Tarantella at Festa Primavera! Any excuse for a festa, a big party! Sometimes it is an annual spring festival at an Umbrian farm located in the center of fields of sunflowers and wheat near Piegaro. 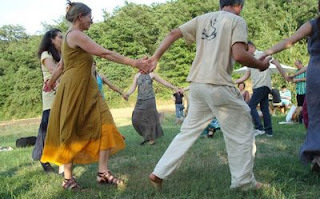 It is a magical place to gather in the month of May for a full day of feasting, singing and dancing! Musicians gather with antique instruments to play the traditional tarantella music for the folk dances of Southern Italy. In this mesmerizing courtship dance, couples entwine and then separate. The woman excites her lover with rapid motions; the man charms her with his elegance and tenderness. The long table groans with food which is replenished throughout the day. Another is full of homemade Sangiovese organic wine that has aged since the harvest in October. 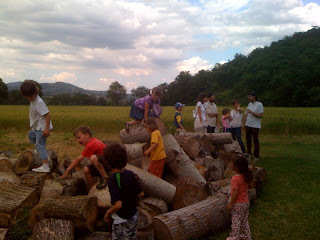 childhood in Israel. Many of these ancient songs have haunting melodies and traditional rhythms that travel easily from culture to culture. Under a cloudless blue sky, spring is welcomed back and winter days are forgotten!